A plaque at the site of the former Customs House (now the Broome Historical Society Museum) commemorates the Centenary of Federation and Australian Customs. 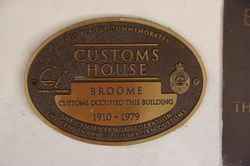 Customs House occupied the site in Broome from 1910 to 1979. The Federation of Australia was the process by which the six separate British self-governing colonies of Queensland, New South Wales, Victoria, Tasmania, South Australia, and Western Australia agreed to unite and form the Commonwealth of Australia, establishing a system of federalism in Australia. When the Constitution of Australia came into force, on 1 January 1901, the colonies collectively became states of the Commonwealth of Australia. The Department of Trade and Customs is established as one of the first seven Commonwealth Departments of State following Federation. 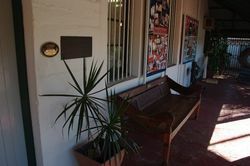 The Customs Act 1901 is given Royal Assent (3 October) and officially commences as the sixth act of Federation.